NASA's New Horizons spacecraft captured this image of an intriguing "X" on Pluto's icy Sputnik Planum region; the X probably marks a spot where four separate “cells” of nitrogen ice came together. There's a big "X" on Pluto, and it marks buried treasure of a scientific kind. 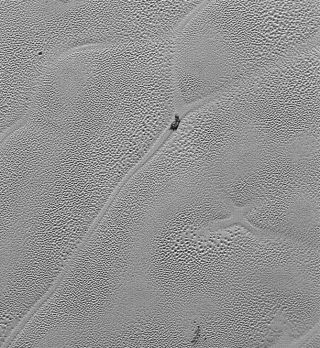 The X-shaped feature, on the huge Pluto nitrogen-ice plain known as Sputnik Planum, is visible in photos recently beamed home by NASA's New Horizons probe, which performed history's first-ever flyby of the dwarf planet on July 14, 2015. The images that make up this high-resolution view of the icy Pluto plain known as Sputnik Planum was captured by NASA's New Horizons probe on July 14, 2015. "This part of Pluto is acting like a lava lamp, if you can imagine a lava lamp as wide as, and even deeper than, the Hudson Bay," William McKinnon of Washington University in St. Louis, the deputy leader of New Horizons' Geology, Geophysics and Imaging team, said in statement. The Sputnik Planum X probably marks a spot where four convection cells once met, mission scientists said. The dark patch to the X's upper left, meanwhile, is likely a dirty chunk of water ice floating atop the sea of nitrogen ice. The photo depicting the X is one of a series of high-resolution shots New Horizons captured of Sputnik Planum with its telescopic camera from a distance of 10,000 miles (16,000 km) on July 14, about 15 minutes before the probe's closest approach (which took it within 7,800 miles, or 12,550 km, of the dwarf planet's surface). The pictures combine to cover a swath of Sputnik Planum 50 miles (80 km) wide and more than 400 miles (640 km) long. The images boast a resolution of 250 feet to 280 feet (77 m to 85 m) per pixel, resolving surface features as small as half a city block, NASA officials said. New Horizons beamed these photos back to Earth on Dec. 24, and NASA released them on Thursday (Jan. 7). While the spacecraft relayed some of its flyby data and images home shortly after the July close encounter, most were stored on board for later transmission. To date, mission control has received just 25 percent of so of the flyby dataset. However, most of the highest-resolution Pluto images (including the newly released Sputnik Planum set) have now been received. Everything should be down on the ground by October or November, mission team members have said. New Horizons is currently cruising toward a small object called 2014 MU69, which lies about 1 billion miles (1.6 billion km) beyond Pluto. The probe will perform a flyby of 2014 MU69 on Jan. 1, 2019, if NASA approves a proposed extended mission.